That unused doorway in your house, through which no member of the family ever passes, may be easily fitted with built-in furniture, which, if constructed separately, would occupy considerable space in the room. 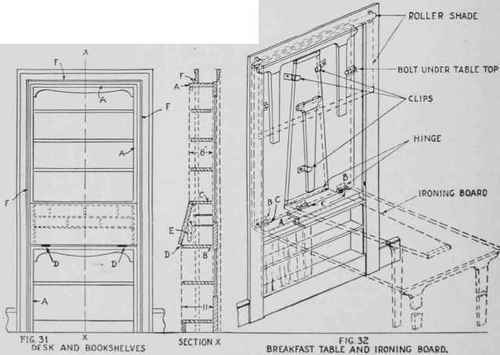 Figures 31-34 show how to build a desk, a linen closet, a service closet, or a combination breakfast table and ironing board. Some of the designs, as in Fig. 33, are adaptable to other pieces, such as a buffet or a china closet. Figs. 31 and 32-. Two suggestions for utilising those superfluous doorways in old houses which are rarely or never used. Built-in furniture of this type has the great advantage of requiring no extra wall space.